1962 – The OmniOffices Group, Inc. (OmniOffices) was created, a privately held executive suites company and an early pioneer of the industry. OmniOffices was later acquired by real estate investment trust CarrAmerica in 1997, and in 1998 the two companies further expanded by acquiring HQ Business Centers. In 1999 the joint company became known as HQ Global Workplaces. HQ (and its predecessors) was eventually acquired by Regus (now IWG plc) in 2004. 1966 – On 1st August 1 1966, Paul Fegen launched a furnished law suite for attorneys. ‘Fegen Suites’ effectively laid the foundations of the serviced office model by leasing office space and fitting it with furniture, reception services, telephony, and conference rooms. Fegen Suites expanded and was incorporated as Attorneys Office Management, Inc. (AOMI) on 1st July 1970 and began providing virtual office services to law firms in 1973 (known as an ‘off-site tenant program’ at the time). Following the devastating recession of 1980-82, AOMI was restructured and later sold, although the Fegen name was retained. On 1st April 1990, Vince Otte acquired the company and changed the name to Barrister Executive Suites, which today has 30 business center locations throughout Southern California. 1978 – Alf Moufarrige founded Servcorp at the MLC Centre in Sydney, Australia. Initially leasing one-quarter of a floor, Mr Moufarrige eventually grew the business centre to 16 offices, all of which came with furniture and services. Then known as ‘multi-tenanted office accommodation’, Servcorp had acquired two floors in the MLC Centre, Sydney and a location in Melbourne CBD inside its first 12 months of trading. Today, Servcorp operates in more than 160 locations across the globe. 1979 – Lenta Business Space was formed by The London Enterprise Agency to promote enterprise development within London. In 2002 the company changed to Lenta Business Centres, and now operates as an independent serviced office provider. 1979 – OTSS (Office, Telecommunications & Secretarial Services) was founded in Northampton, England, by the Fuchs family. It was later re-named City Executive Centres Ltd. and grew to 13 offices nationwide before it was bought by MWB Business Exchange in 2005. Part of the original family business was retained and in 2009, a new company was formed – Office Space in Town – by brother and sister Giles and Niki Fuchs, who continue to run the business today. 1980 – Richard Nissen founded Business Space Ltd at 35 Piccadilly in London in 1980, and later pioneered the digital exchange telecommunications system which launched the virtual office concept in the UK. Mr Nissen registered the trademark name in 1992 when the Virtual Office Group was established at 211-212 Piccadilly. After a period of 25 years, Mr Nissen relocated his serviced and virtual office business to its current address at 180 Piccadilly. The business is still going strong today. > 1980-1982 – The early 1980s recession led to high levels of unemployment and bankruptcies. Businesses became acutely aware of the need to manage cash flow and reduce long-term overheads – including office leases – which is believed by some to have helped serviced offices gain a stronger foothold in the aftermath of the recession. 1980s – During the 1980s, office technologies including word processors, personal computers, voicemail and fax machines became widely adopted. They began to eliminate some of the staffing roles required by businesses, and at the same time some of these services were offered by early business centers – negating the need to hire full-time staff for secretarial purposes. 1981 – OffiCenters was launched in Minneapolis, MN on June 1st 1981. Today, under owner and CEO Lori Spiess, OffiCenters has 6 workspace locations in and around Minneapolis. 1984/1985 – John Gill of Raines Business Centre and Philip Parris of Harvard Offices opened some of the earliest business centres in the UK. In the US, Michigan architect James Blain opened AmeriCenters in Troy, followed later by locations in Indiana, Illinois and Ohio. 1985 – Multiburo Business Centers was launched by François Pasquet. Today, it is managed by his brother Antoine Pasquet (CEO) and spans more than 40 locations across France, Belgium and Switzerland – making it the largest privately held business center operator in continental Europe. 1987 – Regus.com states it was founded by Mark Dixon in 1989, but Allwork.Space understands the company was actually founded in 1987 by Swedish company Reinhold. It later merged with Mark Dixon’s Crosslink company in 1989 to become Regus, the world’s largest business center operator. Today Regus, officially known as IWG plc is traded on the London Stock Exchange (IWG) and operates over 3,000 locations in 120 countries. > 1989 – Tim Berners-Lee invented the World Wide Web – a key part in the development of the Information Age and later becoming integral in the mobile working movement. In 1991 the World Wide Web was released to the public. 1989 – Metro Offices was launched by Kathleen Buchanan, and today operates 9 business centers in Washington, DC, Northern Virginia and Maryland. Buchanan started her workspace career with World Office Services in 1979, and later worked at COMCOR from 1983-88 before leaving to set up Metro Offices in 1989. 1991 – Alliance Business Centers was formed by Steve Tannenbaum, David Beale and Frank Cottle (Chairman). Today, Alliance is the largest global network of serviced offices in the world, with more than 800 locations in 45 countries. 1993 – Citibase was founded by David Joseph and Ian Read, currently operating over 42 business centres in England and Scotland. In the same year, Search Office Space (SOS) was established as the UK’s first serviced office search consultancy. Search Office Space re-branded to Office Freedom in 2018. 1994 – IZA Business Centers opened their first location at Torre Gia in Monterrey, Mexico, and today operates over 30 business centers in Mexico’s largest cities. Also this year, The Executive Centre was founded, and currently operates over 125 serviced office locations across 13 countries. In the same year, David Saul, Simon Rusk, Bernard Klug and Colin Gershinson founded BE Offices (formerly known as Business Environment) in the UK; and the Rockefeller Group Business Centers was launched in New York. 1995 – C-base, founded in Berlin, was one of the first hackerspaces in the world – an early form of coworking. That same year, Ralph Gregory founded Intelligent Office. 1996 – John Arenas founded Stratis Business Centers (formerly Community Business Centers), later acquired by Regus in 2001. > 1999 – The Wi-Fi Alliance was formed as a trade association to promote Wi-Fi technology and certify Wi-Fi products, leading to gradual acceptance and take-up of wireless Internet. 1999 – HQ Business Centers and Omni Offices merged to become HQ Global Workplaces. It was later acquired by Regus in 2004 at a time when HQ had more than 300 business centers in the US and worldwide. That same year, Bernard De Koven launched the word “coworking” as a way to identify collaborative work, and 42 West 24 popped-up in New York City. > 2000-2002: Dot-com crash, which led to consolidations, exits, and bankruptcies in the serviced office industry. 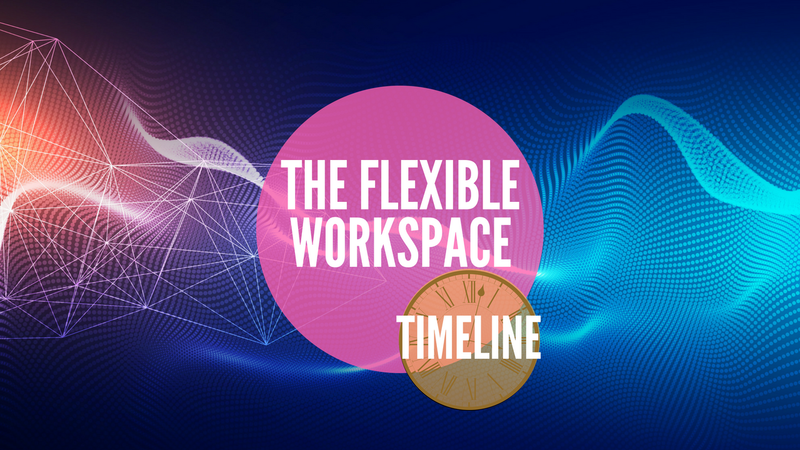 2000 – Flexible workspace brand, BizSpace, launched in the UK and currently operates more than 100 business centres offering a mix of office space, self storage, industrial units and workshops. Evans Easyspace launched in the UK in the same year and was later acquired by Regus in 2014. In 2015, it was subsequently bought by investor Bridges Ventures for £84 million. Regus was retained under a partnership agreement and continues to operate the Evans portfolio. 2001 – Stratis was acquired by Regus. Stratis had 12 centers with 3 under development for a $10 million deal. 2002 – Premier Business Centers (officially Premier Office Centers, LLC) was founded in Irvine, California. Under CEO Jeff Reinstein, the company has grown from 9 locations to over 90 centers across 57 cities, and is the largest privately held provider of executive suites in the United States. 2003 – Peter Kershaw, original founder of HQ Global Workplaces, bought back the European operations of HQ, which became known as Executive Offices Group (EOG), a high-end serviced office operator in London. 2003 was also the year that Office Evolution, a franchising workspace model, was founded by Mark Hemmeter. In 2005, EOG was sold to Morgan Stanley Real Estate Fund. In 2013, when EOG operated 28 serviced office locations in London, it was bought by Queensgate Investments and rebranded in 2014 to become London Executive Offices (LEO). > 2004 – Around this time, there was accelerating adoption of personal computers, Internet usage, storage technology and data access speeds, which began to open new opportunities and greater acceptance of virtual and flexible working. 2005 – The official first “coworking space” opened in San Francisco by Brad Neuberg. That same year, the first Impact Hub coworking space launched in London. Today there are over 100 Impact Hubs across 50+ countries with more than 16,000 members. > 2007/2008 onwards – The mobile revolution. Consumers and entrepreneurs used Wi-Fi enabled handheld devices at home, at work and on the go. It enabled business people to work seamlessly from virtually anywhere, and radically changed the business landscape. Around this time, coworking began to expand and the term “coworking” was seen as a trend on Google’s database in 2007 for the first time. > 2007-09: Economic crisis and global recession. The credit crunch and ensuing financial crisis left a legacy of heightened cost efficiency measures. Arguably, many parts of the serviced office industry benefited from new-found business requirements for shorter office leases and greater flexibility. Yet business centers and coworking spaces weren’t immune to the recession, which left many with high vacancies and their own long-term lease deals to contend with. 2010 – Adam Neumann and Miguel McKelvey founded WeWork, a shared workspace company, which currently has more than 430 locations across 86 cities worldwide. 2013 – In London, AIM-listed Serviced Office Group acquired Avanta Managed Offices, resulting in 37 properties as part of ‘Avanta Serviced Office Group’. In the same year John Arenas launched Serendipity Labs, a coworking franchise model, and Industrious was launched by Jamie Hodari and Justin Stewart. In 2015, Avanta Serviced Office Group was acquired by Regus (now IWG plc). 2015 – Regus made a significant move in the coworking sector by acquiring Spaces, a workspace operator founded in The Netherlands that’s now expanding across Europe, North America and Asia Pacific. 2015 also saw the launch of Chinese coworking brand UrWork. 2016 – the UK votes to exit the European Union (‘Brexit‘) in a move that could significantly shake up the country’s flexible workspace market. 2017 – i2 Office takes over Landmark Offices Plc, later re-branding to Landmark in 2018, and Regus acquires Basepoint. Additional funding from Japan’s SoftBank Group takes WeWork to $20billion valuation. Chinese coworking brand UrWork merges with NewSpace and later partners with Serendipity Labs to take on the global market. Also in 2017, the commercial property industry breaks ground in flexible workspace: Savills launches Workthere, Blackstone buys a majority stake in The Office Group, and British Land sets up Storey.